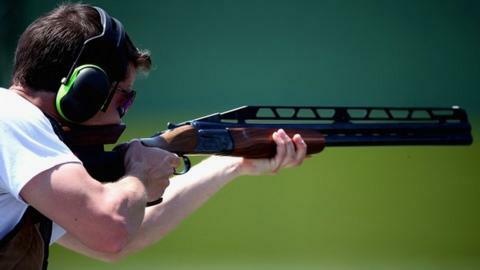 Britain's men's double trap shooters won team gold at the European Championships in Maribor, Slovenia. Matt Coward-Holley, Steve Scott and Tim Kneale secured the medals as all three impressed in the qualification rounds. Kneale came fifth overall while Scott and Coward-Holley had to settle for runner-up places in qualification. "It feels amazing. This is the first team gold I've ever won with British Shooting and it's absolutely fantastic," said Kneale. "It's great to have the guys to celebrate with. It was a proud moment to see the British flag in the number one spot on the podium and having the national anthem playing is just great. "We've got a good mix of senior and junior talent and that's highlighted in the junior double trap silver medal we've also won today."